How to import specification files to get a jumpstart on creating tests. 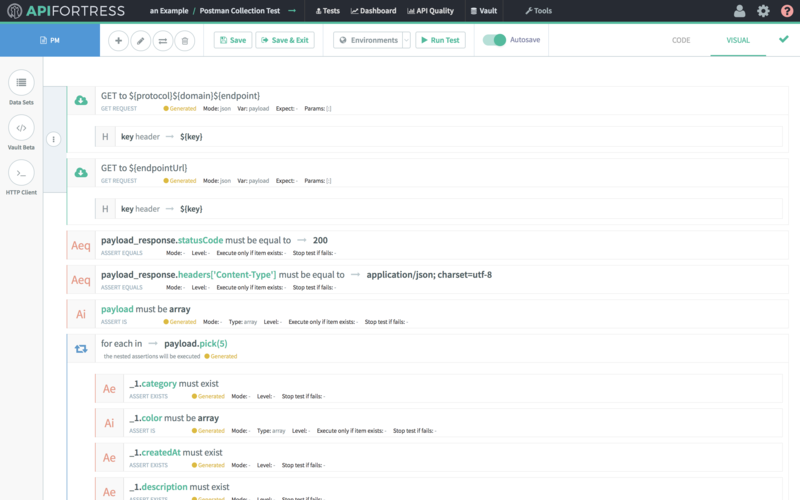 API Fortress can now generate a test from a Postman collection! 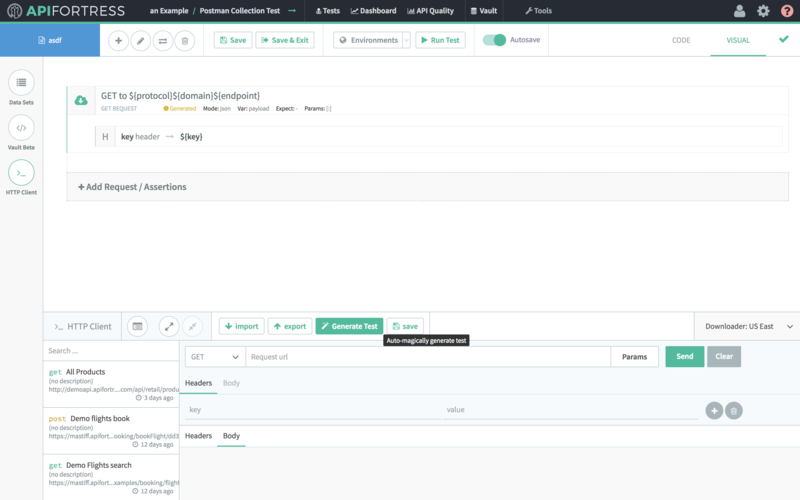 The first step is exporting your collection from within Postman. 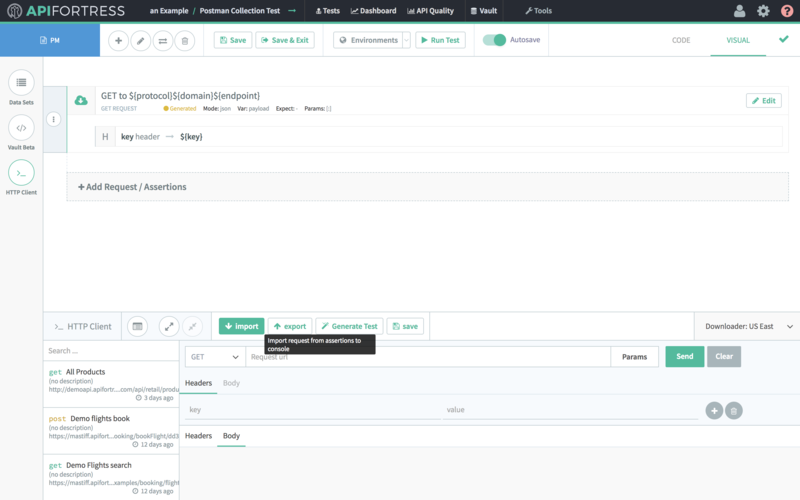 Once you’ve exported the collection from Postman, go to API Fortress and create a New Test. On the interstitial page, click Build from Spec. On the following page, choose Postman Collection from the dropdown menu, and upload the collection file we exported. Click Save. For a new test, choose From Scratch and then click the check. If you were updating a test, you would use the Merge option. This imports the API call to the composer. Now we can use this to call the payload and build a test automatically! The easiest way to create a test is using our Magic tool. To do so you need to import the call into the console. First, select the call in the composer, which will highlight it. Open the HTTP Client and click the import button, highlighted below. When the call is in the console, click the Send button and you will see the response. At this point, the Magic tool can generate the test for you. Click the “Generate Test” button, highlighted in the image below. Click Continue a few times and voila, a complete API test generated without having to write any code. You can then review the test, seen below, and add some more logic. You’ve successfully created a test from a Postman collection! You can now generate a draft an API test from the I/O Docs in your Mashery account! On the test interstitial page there is a “Build from Mashery” button. Click it, enter the Username, Password and Area ID from your Mashery account. Area ID can be found when you login to your Mashery account. In the top right under Customer name. Choose the I/O Doc you want to use, and then click the lightning bolt. You can also have API Fortress generate some assertions for you by using the ‘magic’ tool. 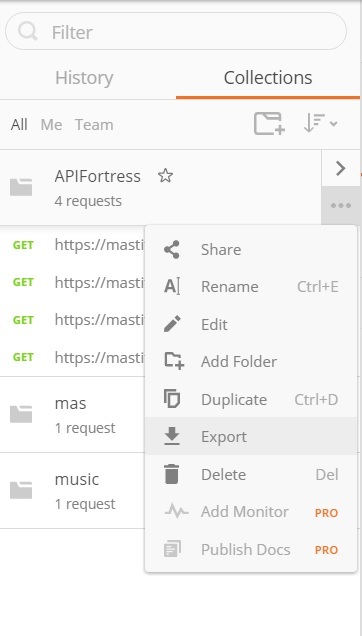 From the composer, click the “import the request into the console” button from the top navigation. The HTTP console will open. From there insert the required values and make the call. Finally, click the Magic Wand icon (skip the global/input set generation step) and that’s it. 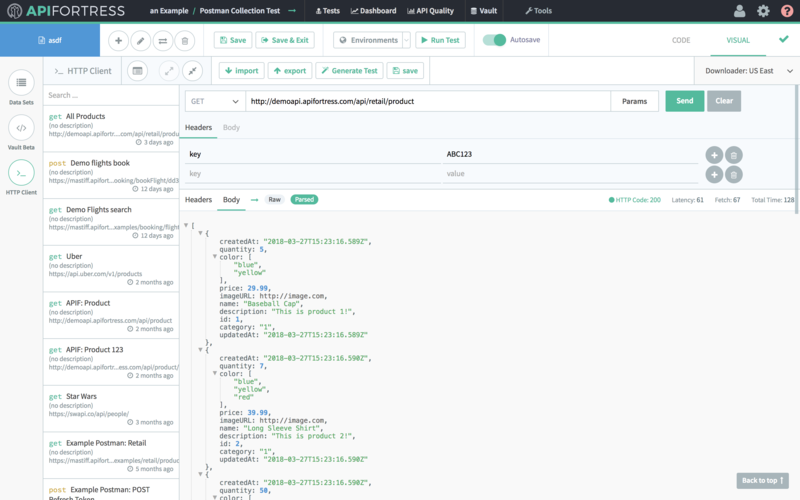 An API test is created for you! From here you can add more intelligence to the test. Maybe make it an integration test with more calls, or add an IF statement. A lot of options are at your disposal.